Both Еa, Enki and Marduk were often represented as half man- half fish. Later they began being worshipped under the name Dagon. « Dagon", Fish the man ”, has arrived in early Babylon as the reformer and teacher. Having appeared from Erythraean (Red) sea, he has brought to them a civilization, letter and sciences, law, astronomy, religion, taught them an agriculture, geometry and arts »*. In the Bible there are some indications on worshipping Dagon by Ham's offspring - Philistines (Jud.16:23, 1Sam.5:2). According to the Catholic encyclopedia ( http://www.newadvent.org/cathen/04602c.htm ) « Dagon is sometimes associated with a female half-fish deity, Derceto or Atargatis, often identified with Astarte......». In the Ancient-Greek myths about the creation of the world at first from Chaos first occurs Gaia - the goddess of earth, then - god of love Eros, who on early paintings was represented as a dragon. And here is what Chinese Cosmology Tao says about the creation of the world. Before Tao there was no existence, Wu-Wu -vacuum, but with Tao Wu-Chi–Endless arrived. From Endless Hun Tyun –Chaos arrived, Large Space Sea, where the first point of Tai-Chi-Large Pole was developing. From Large Pole Tai-Chu-Large First arrived, which had the form. Subsequently Tai-Shih-Large Beginning appeared which had breath or Chi. The form and breathe united to make Tai Su - Large Immemorial Dragon of Wisdom. People for the first time appeared from the waters of the Space Ocean, and at first they were men-fishes. The most important goddess in China, Quan Yin, was often represented in the form of a fish, and Nu-Wa was a Rainbow Dragon, water snake or woman. According to the legends, yellow dragon appeared from the waters and taught legendary Emperor Fu Shi the elements of writing. Many Chinese cities use pagodas where people used to burn incense and pray to dragons up to this day. A relic of dragon and the altars are concentrated usually along the seashores and riverbanks, because the majority of eastern dragons as they think live in the water. Dragons are so wise that they even were royal advisors. The legends say that Cambodian king in the 13th century used to spend his nights in the golden tower, where he consulted the real ruler of the land - a nine-headed dragon. The images of dragons were the integral part of the royal palace and the houses of aristocracy. As against the standard image of a dragon with four claws, the dragon with five claws was the symbol of the King, and any subject with the image of a dragon with five claws intended for service of the emperor. 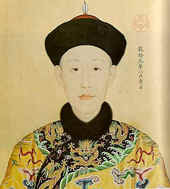 In the picture: the emperor Chien – of Long Ching dynasty (1736- 1795), on his clothes there is a five-claws dragon. To please and calm the dragons people made fireworks and carried huge paper dragons on special parades. This tradition remains unchanged today. In the photo: the parade with a scarecrow of a dragon in China.